Does this contain every missing person and unidentified body? Use our app to search the NamUs database and help solve an open case. The missing persons database is made up of reports submitted to NamUs. The unidentified deceased persons database is from reports uploaded by coroners, medical examiners and other authorities. Why don’t some cases have photos? Photos are included if coroners, medical examiners or other authorities submitted them to NamUs. What are the artistic renderings? In some cases, artist drawings or clay models are created from the remains to approximate what the person may have looked like. How can I look at one case and see possible matches? 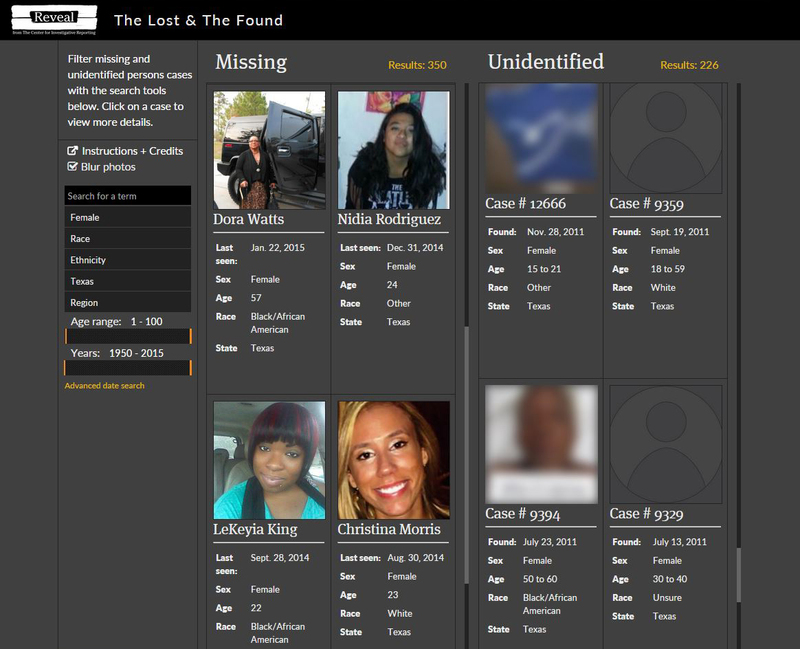 If you click on a case from either the missing persons data or the unidentified data, you will be able to narrow the search for the other database and scroll through possible matches. What do I do if I think I’ve found a match? If you select both cases from the database, you will be prompted to submit a match to Reveal, and you will be given instructions on how to report the information to the proper authorities. What do I do if I want to report someone who is missing? Check out our tips about how to contact NamUs directly.